Sekalaiset keskustelut pöllöistä 2017 - Sivu 7 - Ospreys Nest Forum - The Place To Be! Kiitos , marksaa, tiedosta Didiin liittyen. Niin surullista , voi tuska. No, nyt on uusi kuuluminen - uusi rouvaehdokas singahtanut paikalle, OOOOOootellaan jatkuuko Jasperilla talonpito uuden muikin kaa? Tuesday night, November 28th at 8:39 pm, Didi went on a flyabout and did not return. 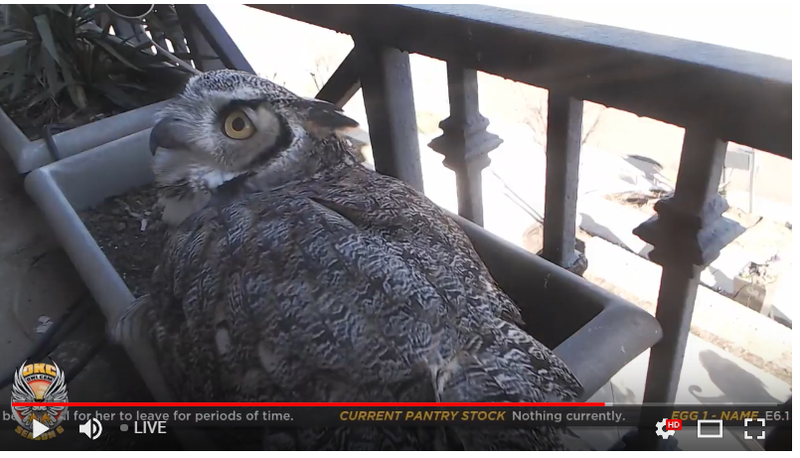 The owlbox owners were notified via email during the night and woke up to hear the sad news that Didi never returned. That morning, Wednesday, November 29th, they turned off the cameras and checked on the owlets only to find out they all perished. They were all very young and unable to regulate their own body temperatures during the cold night. OCG and Ang buried them in the garden near the owlbox. They also checked everywhere they could for Didi but never found her. We will never know what happened to her, but we do know she would never leave her babies which she so loved very much. 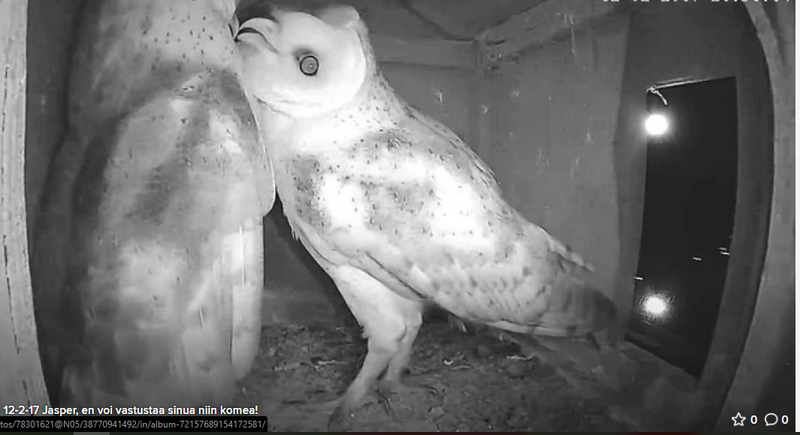 OCG and Ang along with all of us who so love these wild barn owls are very saddened with the loss of Didi and her owlets. Didi ei koskaan palannut. 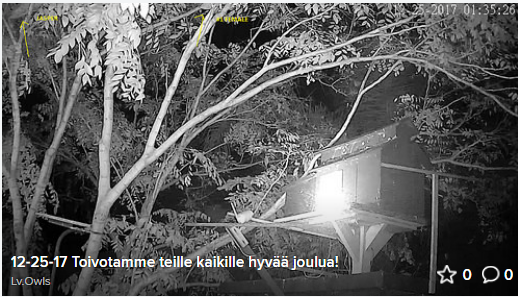 Aamulla, keskiviikkona 29. marraskuuta, he sammutivat kamerat ja tarkkailivat owletteja vain selville, että kaikki heistä ovat kadonneet. 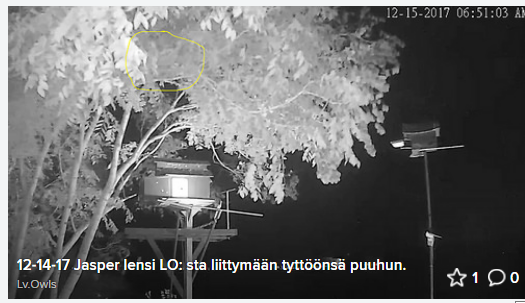 He olivat kaikki hyvin nuoria ja pystyivät säätelemään omia kehon lämpötilojaan kylmä yöllä. 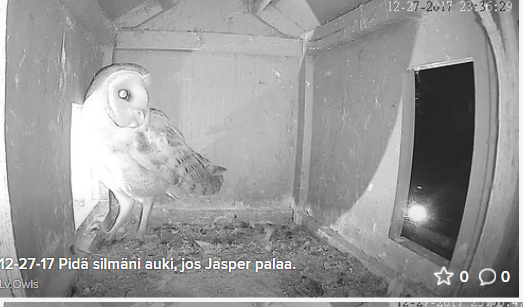 OCG ja Ang hautasivat heidät puutarhaan owlboxin lähellä. Amerikanviirupöllöt ovat avanneet pesintäkautensa 5.12. , jolloin ensimmäinen muna ilmestyi ja kuvan lähettäminen aloitettiin. Pesä sijaitsee Lake Okeechobeessa, Floridassa. Viime vuonnahan kuoriutui kaksi poikasta, mutta molemmat menehtyivät ennen pesästä lähtöä. 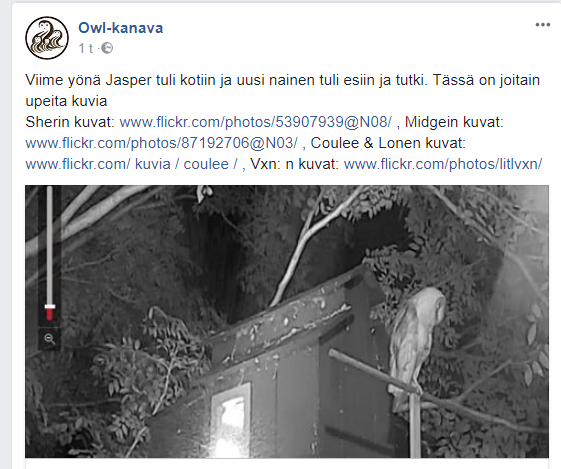 Jotain virusta epäiltiin. We've had a wonderful amount of much-needed rain recently. This has left gardens absolutely soaking wet. Of course, garden birds have not escaped the heavy rainfall. In this rain, Lady has sat diligently on her eggs, doing her best to keep the eggs dry and warm. After heavy rain again last night, we woke up to find Lady gone and the eggs abandoned. We're not sure if this persistently heavy rain influenced her decision or if there are other reasons. Pappa isn't around this morning either which leads us to believe that it was a deliberate decision to abandon eggs they feel are unviable. Of course I'll only rest well when I see them both flying around again. Will keep you posted. Voi PPO:ta! 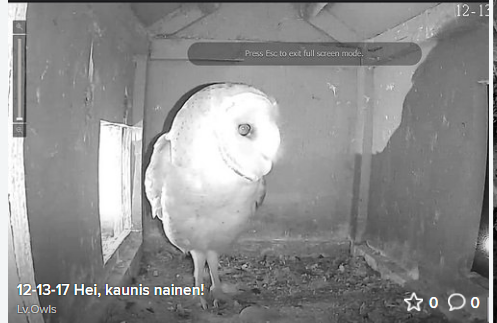 Kurja kuulla, että pesintä epäonnistui toisen kerran! Amerikanviirupöllöillä on nyt kaksi munaa, Toivotaan parempaa menestystä kuin viimeksi. Suoratoisto aloitettiin 6 tuntia sitten.